bonjour change, au revoir steady schedule. as i type away donning TranquiliT, chanel glasses, and chenille slippers, i'm basking in silly disappointment. after stumbling to the computer this morning with a sore throat, i opened my email to find my final grade from my professor . . . a B+. booooooo. i knew i was on the edge - 88, 90, 88. but a B+? might as well be a C at that point. wahhhhhh. needless to say, it has colored my day. initially i shed a tiny tear and threw a tiny tantrum to beau who proclaimed "B+ is the new tuesday?" um, ok, enough ridiculous drama. gotta study for tomorrow's final which is a tough one . . . statistics. ugh! more wahhhh. this week has been the launch into new scheduling. said au revoir to a class i've taught for 10.5 YEARS, had final monday MSW class for awhile, and said a 3-month au revoir to another class i've taught off and on for 10.5 years. next week i embrace summer school during my normal teaching times, pick up a new class, and bask in public policy class for 7 hours/week. whew! honestly, the shake up (once i got over the shock that i had to do it) is feeling good, exciting, and oh-so-right! teacher training graduation. so proud of this year's grads. talented bunch! finale stats class and turned in final paper. took abnormal psychology final = B+. boooo. i digress. oodles of work on new tranquil space website - to be launched soon. healing: physical therapy and acupuncture. artist date: georgia o'keefe exhibit at the phillips collection = divine. meeting with contractor + architect for new arlington studio space. woo hoo! organized my tiny "executive office" at tranquil space. read half of ted leonsis' book "the business of happiness" - dig it! study for stats final - ugh. prep for tonight's artistic extravaganza facilitated by mindy of wish studio. concluded the tranquilista lifestyle: joie de vivre e-course. SUCH talented women. ate oodles of cheese and greens. 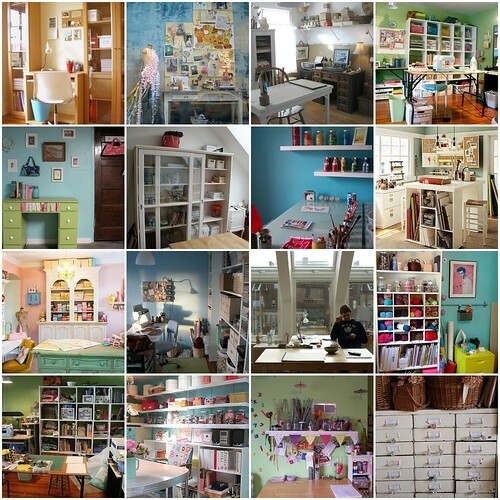 mused on ways to turn chez moi into a more creative empire such as these closets turned offices and this collage of fabulous craft rooms and this blog on craft space. set up a trunk show in costa rica during my upcoming retreat. how did your week unfold? were you able to knock off your MITs (most important tasks)? hope your may dreams are feeling fruitful. wishing each of you a beautiful, creative, A+ launch into your weekend. may you find a way to shake things up and experience the freedom that change brings (sans B+s). Sorry to hear about the B+, but a B+ isn't a bad grade at all! So congrats! Good luck with stats! My MITs were completed, turned in two papers this week and finished my first year as a doc student. Woo! And today, I celebrated with an hour and 10 mins of yoga to cleanse away all the pent up stress. Wow, sounds better than my week. All I did was get Dx with mono...hmmm. I understand you're disappointed. But let's see ... you oversee (hands on, really) three VERY successful businesses, plus you're out there promoting your new book AND you're in grad school and MORE! I believe your next A+ will even this one out. Hang in there! Let go of your perfectionism, Kimberly. Yes, you WANTED an A, but you've been through a lot of late and remember that B+ is better than above average! As a homeschooling mama, I say this to my girls - especially my perfectionist 10 year old - all the time. Love when you do the "week in review". Lots of accomplishments, you go girl! Btw, that cheese platter looks delish! Is there a way to view enlargements of the office space collage? Some of them look very inspirational. I work in academia, and a B+ is much better than a C. Good luck on your remaining test(s). A B+ ROCKS. Pat yourself on the back for a job well done, consider everything else you do in a day, and be grateful that your brain is able to keep up with you! kristine, the collage is from flickr and it's as large as it gets. i hear ya, would love to see more details. SO inspiring, eh? lynne, yep LOVE me some cheese plates!